Enjoy a tropical island vacation in your own backyard! Throw a fun and casual party and enjoy the thrill of gathering your family and friends around this 36 inch fire pit for a tropical island night. It's made from rust-resistant aluminum with a hand-brushed, dark bamboo finish and features a natural slate top enhanced by genuine copper accents. The porcelain-coated fire bowl has a copper finish to complete the look. There is no need to concern yourself with tearing down existing walls, ceiling height, or dirtying your carpet. Your new Sunjoy fire pit comes with everything you need to extend your living area to your outdoor space. You will thoroughly enjoy it. All these benefits make the decision to buy easy. Order yours today! Napoleons Patioflame<sup></sup> provides aesthetically pleasing warmth to your backyard oasis. The burner is constructed from all stainless steel for maximum outdoor durability and weather resistance. The Napoleon Patioflame<sup></sup> GPF easily installs anywhere and keeps the outdoor chill away. The Patioflame<sup></sup> is approved for use on wooden decks, stone or brick patios and concrete. The Martin Wood Burning Fire Pit is the perfect addition to any get together - entertain your family or guests with the calming sound and comforting aroma of crackling firewood. With its rubbed bronze finish and sleek, yet robust shape, the Martin offers a universal style. Surrounded by mesh, its deep bowl allows you to stockpile and set up logs however you would like. Additionally, it has vents to keep oxygen circulating for a more consistent fire. When need be, remove the mesh spark guard and efficiently tend to your fire with the poker. Sit back and enjoy the chic, angular design as your contained fire roars and glistens. Kohala Natural Outdoor Fire Pit Enjoy a tropical island vacation in your own backyard! Throw a fun and casual party and enjoy the thrill of gathering your family and friends around this 36 inch fire pit for a tropical island night. It's made from rust-resistant aluminum with a hand-brushed, dark bamboo finish and features a natural slate top enhanced by genuine copper accents. The porcelain-coated fire bowl has a copper finish to complete the look. There is no need to concern yourself with tearing down existing walls, ceiling height, or dirtying your carpet. Your new Sunjoy fire pit comes with everything you need to extend your living area to your outdoor space. You will thoroughly enjoy it. All these benefits make the decision to buy easy. Order yours today! Kohala Natural Outdoor Fire Pit is rated 4.4 out of 5 by 25. Rated 3 out of 5 by HS from Product arrived with a broken chair. Product arrived with a broken chair. Rated 5 out of 5 by JB from The Seabrook dining set is very nice. It is not a problem to put together and the seat are roomie... The Seabrook dining set is very nice. It is not a problem to put together and the seat are roomie and comfortable. I have had this set for a year now and no rust. You won't be unhappy with this set. Rated 3 out of 5 by HS from The set arrived with a broken chair. The set arrived with a broken chair. Rated 3 out of 5 by Vols48 from The patio set is absolutely beautiful. Seats are comfortable, BUT... The patio set is absolutely beautiful. Seats are comfortable, BUT I have only had it since March of this year and the grout on the table is already cracking and coming loose from the outer rim. Very disappointed as it will not last. I waited a long time to get this set. Rated 5 out of 5 by Toucon from Enjoying our patio set, just beautiful and excellent quality. Only... Enjoying our patio set, just beautiful and excellent quality. Only problem in assembling it was, had to buy different screws for chairs as they were not long enough. Would highly recommend this set to others. Great value for the price. Have had many compliments on it. Rated 5 out of 5 by DIYGuy from Very Nice High Dining Set It is very hard to find a nice high dining set. This one fit the bill perfectly. The chairs are very comfortable, excellent that it has Sunbrella fabric. The table top with the tile is very pretty and as a bonus quite heavy and sturdy because of the tile. Products were packaged well and no damage at all. The assembly was not too difficult, maybe an hour. Overall, very pleased with product. Can this be used as a grill? 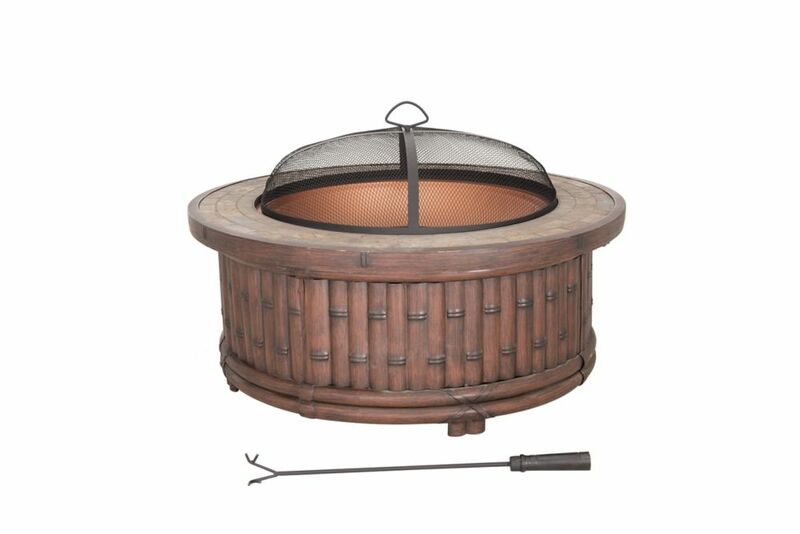 Is it possible to use this fire pit to cook some meat over charcoal?